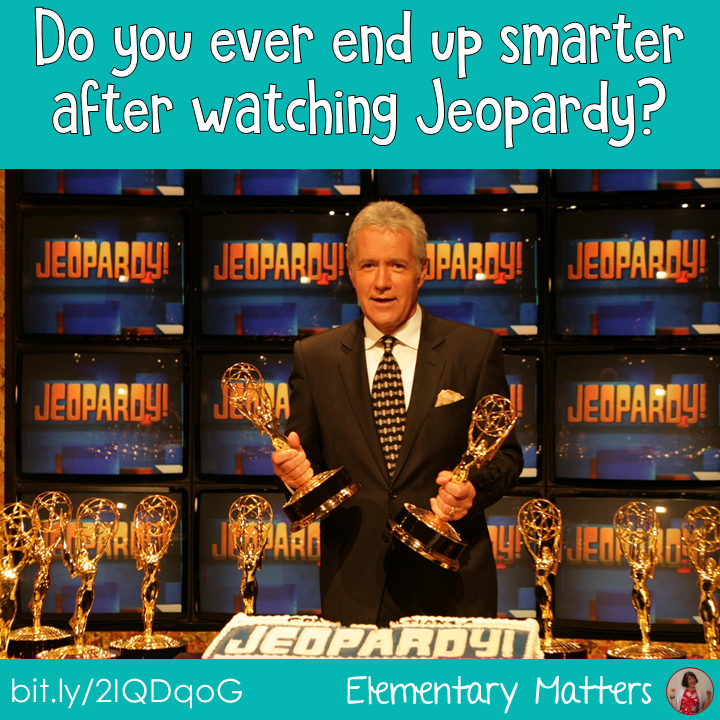 Elementary Matters: Do You Ever End Up Smarter After Watching Jeopardy? Do You Ever End Up Smarter After Watching Jeopardy? Have you ever watched Jeopardy? Who Wants to be a Millionaire is another fun trivia show to watch. Once in a while I'll know an answer, but I could never get past the first level without Google! What do these all have in common? After you've watched the shows, or read the Brain Quest sets, you end up knowing more than before! This is pretty much the reasoning behind a study strategy known as Retrieval Practice. Retrieval practice includes "practice tests" as a method of seeing what a student can remember, or retrieve from his memory. This strategy helps them know what they still need to study. Check out this link if you want to know more about this strategy: Learn How to Study Using Retrieval Practice. 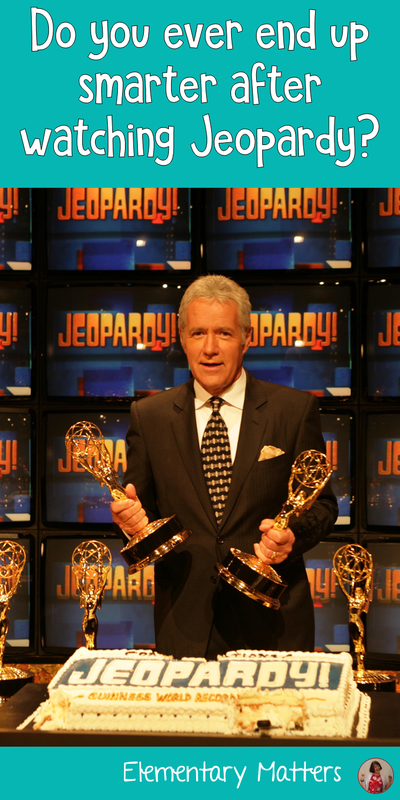 Remembering what was questioned on game shows or trivia cards isn't quite the same as studying what was already taught, but seriously: if you try to think of an answer, then hear the answer, you are more likely to remember it, aren't you? Since there is so much knowledge out there that the children just absorb when they're exposed to it, why not expose them to more knowledge? Canada, USA, or Both? is perfect for July, since Canada Day and Independence Day (USA) are celebrated at the beginning of the month. If you don't teach summer school, That's ok. It's fun to learn about these 2 North American countries any time of year! What Landform is This? is a great supplement to any work on Geography. I like to expose the children to this before I actually start working on landforms. Since the children can use the BOOM Learning Digital Task Cards over and over, they love to challenge themselves to get more correct each time! They become familiar with the vocabulary as well as the different geographic features of each landform as they practice. 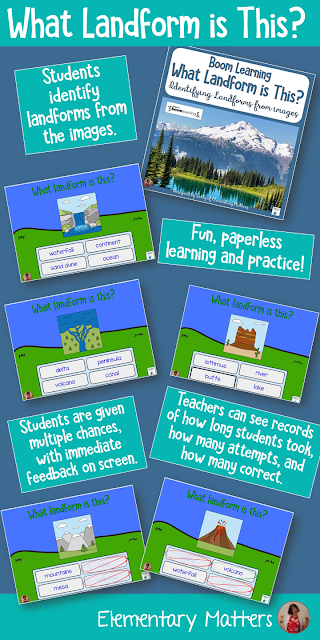 Plus, the teacher can easily go into the records to see how well they are getting to know their landforms! 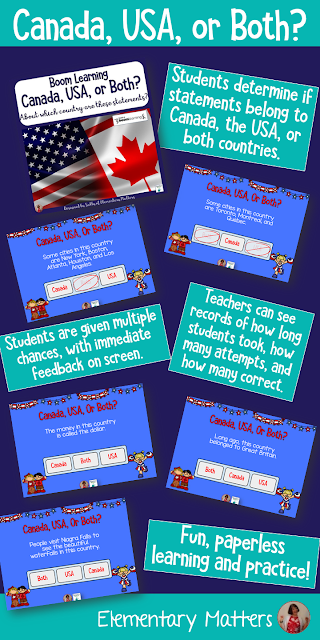 Here are a few more sets of BOOM cards that are "self learning:"
Not familiar with BOOM Learning digital task cards? 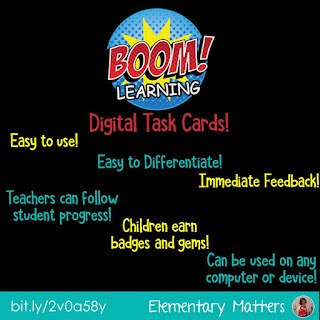 Here's more information, plus a freebie: Have You Heard about BOOM Digital Task Cards? Why am I Sharing 30 Days of Self-Affirmations? Five Ways to Get Them Learning OUTSIDE! Looking for ways to make it until Summer?